I never wrote much publicly about this opportunity and experience that came together like a whirlwind. I'm not sure of the reasons why I didn't talk more about because it was one of THE most special athletic events for me to date... and one of the most HUMAN (humbling) experiences in recent memory. I truly believe I was simply blown away by the entire adventure. 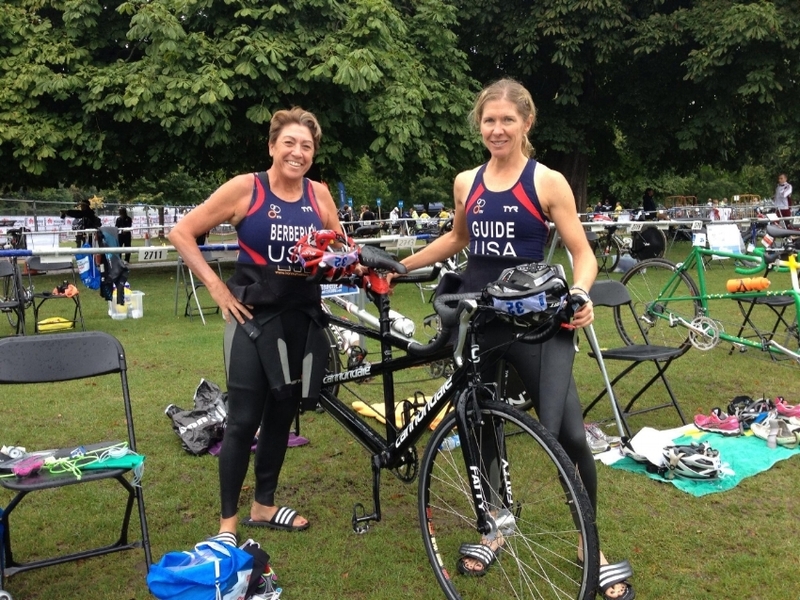 The long story short is that I was connected through a mutual friend to see my interest in serving as a visual guide for Diane Berberian, aka the Iron Maven, for the ITU Paratriathlon sprint race in London. I can't remember how much time I had to think about it, but I felt like it was a few days and the race itself was less than a few months away. I spoke with Diane via phone to learn more about my roles, which would essentially involve serving as "her eyes" during the race. I had never done anything like this before, so I was immediately excited (okay, nervous) while feeling an immediate connection to Diane. She is not fully blind, but she is visually impaired due to her macular degeneration. Check out her story on her Iron Maven website. When I arrived in Florida, I was quickly in awe of Diane's attitude. She was super supportive of ME as her guide even though we had only a few conversations prior. The goals at the London race were to race hard, race safely, but have fun. But first... there was that tandem bike thing I needed to learn. Luckily, an experienced guide named Lindsay made a visit to give me a crash course in captaining a tandem. Diane's name for the bike was "Black Betty", which gave me giggles and helped to bring my tension down a bit. Diane and I got in a swim, a ride, and a short run in the couple days prior to our departure for London. All along I thought I was supposed to be the "lead" for our duo, but in reality, she was fully in charge and brought nothing but confidence and fun to our adventure. There were certainly some stressful times traveling to London and getting Black Betty (and ourselves) to our destination hotel in London. We both did our best to remain composed and use laughter to let go of the hustle and bustle. We got a chance to ride most of the course the day before the race and get in a practice swim. To be honest, the cycling leg was what I feared most. There were tight turns (like 360s) and well... there was the whole tandem thing. And then the forecast was for drizzle and light rain on race day. Egads! Sure enough, race day brought clouds and drizzle, but we were ready to give it a go. Diane was amazing in that although she was competitive, she let me know that safety was most important for us. Deep down, I sensed she knew I was quite nervous about handling the tandem on a wet road, with tight turns and a bunch of other racers around us. The swim start was amazing and I remember feeling teary for how lucky I was to be there supporting Diane. The water was chilly, around 61 degrees, but the excitement took over. I don't remember much from the swim other than we swam steady and fairly straight. The bike leg required extreme focus from me, mostly because I didn't want us to crash. And the fact that I had little experience in being captain on a tandem or racing in these conditions period. I had to unclip from the pedals with each 360 degree turn (I think there were at least 4 of those) and I'm sure I stressed out Diane each time. She was pure awesomeness though and I could feel her energy powering us through! The run was the most fun for me. Was it because we were done with the bike? Maybe. The path was partly through a park and due to the rain, some of the footing was slippery. I was extra cautious to yell out to Diane anything that could be tripped on. "Bump on the left coming up!" "Small hole on your right!" "Sharp and wet left turn ahead!" She was quite calm in responding "Got it!" "Okay" "Heard you!" The highlight of the run was towards the end with what we now refer to as "The Pass". A pair of our competitors in the same visual impairment category made a wrong turn and we blew past them to sprint to the finish line. Seconds later, we were done. I don't have an official race finish picture, so only the one you see above and the memories that float around in my head. The words I stumble on to try to describe this whole experience include: life-changing, bold, daring, scary, thrilling, and honored. Diane taught me so much about her visual impairment and how the things most of us take for granted are affected by her macular degeneration. Without question, she gave me new perspectives on the 'ordinary' challenges that I face daily. Which are really minuscule in the grand scheme. Thank you, Diane, for teaching me how to be one notch stronger, braver, and grateful. You are a true heroine and I'm proud to have served a tiny role in one of many journeys where you demonstrate hope, perseverance, and resilience.